Friday, 24 June 2011, Day 213/365. 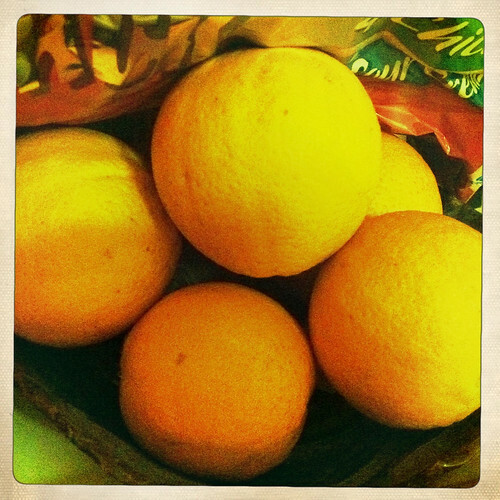 I have an orange tree and it/I grow pretty damn good oranges. They’re ripe now and I’ve been enjoying taking an orange to work every day. A friend texted me yesterday to ask if she could come and get some as she’s also been waiting until they’re ripe. I usually have too many to eat just for ourselves so I don’t mind letting friends have some. I even cut up some for half-time at football last weekend as the assigned orange bringer for that week wasn’t able to make it. Because these oranges taste so good I NEVER buy them, never. « No entry. No floor.